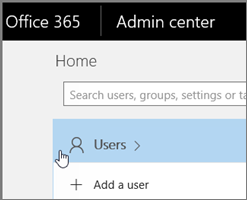 Your primary email address in Office 365 is usually the email address you were assigned when your Office 365 work or school account was created. The primary email address could also have been changed by you or an admin at your organization. When you send email to someone else, your primary email address is what typically appears in the From field in email apps. You can also have more than one email address associated with your Office 365 for Business account. These additional addresses are called aliases. For example, let's say Ina's primary email address is Ina@Contoso.com. She also wants to receive email at Ina.Leonte@Contoso.com and Sales@Contoso.com. You can create those aliases for her, and all the mail sent to those aliases will go to Ina's Inbox. TIP: If you want multiple people to manage email sent to a single email address like info@contoso.com or sales@contoso.com, create a shared mailbox. To learn more, see Create shared mailboxes in Office 365. 3. On the Active users page, choose the user. 4. On the user's page, next to User name / Email, choose Edit. 5. On the Edit email addresses page, in the text box under Alias, type the first part of the new email alias. 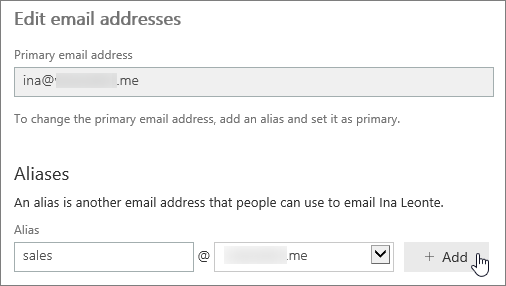 If you added your own domain to Office 365, you can choose the domain for the new email alias by using the drop-down list. Then choose Add. Note: The email alias must end with a domain from the drop-down list. To add another domain name to the list, see Adding additional domains to Office 365. 6. When you're done, choose Save. It may take 15 minutes or more for the change to propagate properly. 7. The user now has a primary address and an alias. All mail sent to Ina@contoso.com and Sales@contoso.com will go to Ina's Inbox. Note: When the user replies, the From address will be her primary email alias.